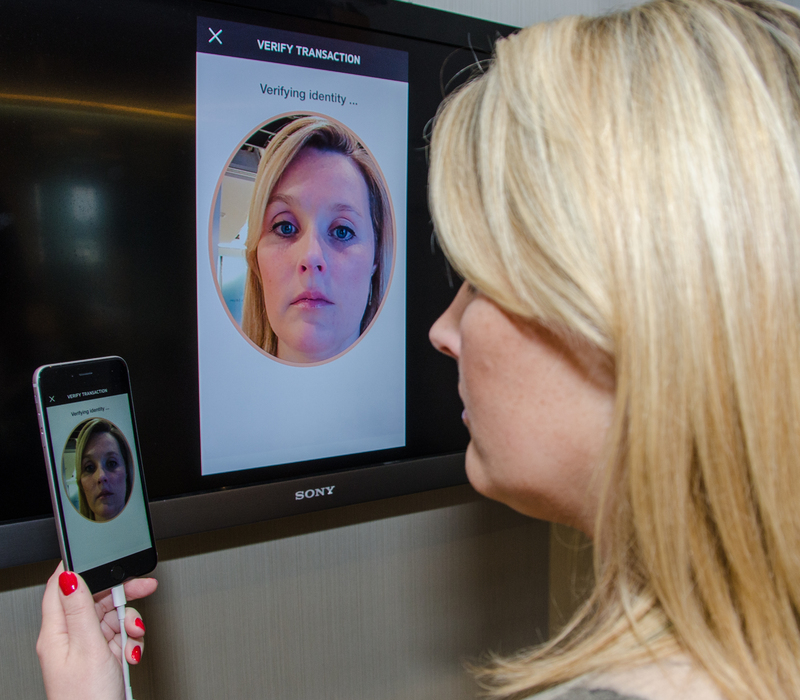 LONDON, 23rd January 2018 – Mastercard announced today that all consumers will be able to identify themselves with biometrics such as fingerprints or facial recognition, when they shop and pay with Mastercard by April next year. In practice it means that banks issuing Mastercard-branded cards will have to be able to offer biometric authentication for remote transactions, alongside existing PIN and password verification. It will also apply to all contactless transactions made at terminals with a mobile device. The increased availability of biometric capabilities on tablets and smart phones – consumers’ clear preference for these kind of solutions – and the EU’s new regulatory requirements for strong authentication suggest that the time is ripe for enabling biometric validation solutions for digital payments. Banks also report that when such biometric authentication is used, customers are much more inclined to go through with their purchase. The abandonment rates can drop by up to 70% compared to other methods like One Time Password sent via SMS, which reflects the much improved user experience. Existing methods to prove an identity online can take shoppers away from a retailer’s website if it is time consuming or complex. One way to solve that is moving from a reliance on what the consumer knows (e.g. passwords) and what they have (card or smart device), to what they have (e.g. mobile phone) and who they are (their biometrics). 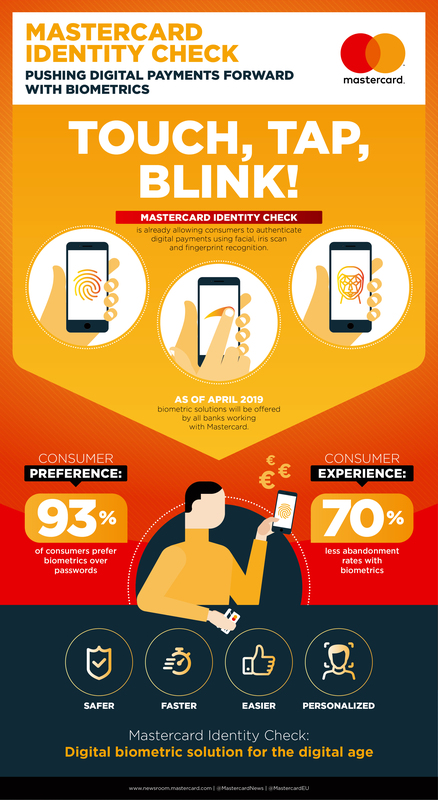 Mastercard has been leading the advancement of biometric technology in payments for years with a focus on improving both consumer experience and security online and offline. Mastercard Identity Check, now available in 37 countries around the world, is an authentication solution that enables individuals to use biometric identifiers, such as fingerprint, Iris and facial recognition to verify their identity using a mobile device during online shopping and banking activities. This solution dramatically speeds up the digital checkout time, improves security and reduces abandonment rates. This shift to biometrics is part of Mastercard’s new action plan to help banks and retailers to prevent fraud and improve the consumer experience in the new digital environment. It also meets new regulatory requirements around Strong Customer Authentication set out by PSD2 and is aimed at ensuring a smoother consumer experience and reducing unjustified declines. It includes a new set of services recently designed such as Mastercard’s Decision Intelligence or Automatic Billing Updater that leverage most contemporary technologies, including artificial intelligence. With this approach, Mastercard will help its partners not only to comply with requirements set out in the new PSD2 legislation, but also to go further in optimising the checkout experience of their customers. Mastercard (NYSE: MA), www.Mastercard.com, is a technology company in the global payments industry. We operate the world’s fastest payments processing network, connecting consumers, financial institutions, merchants, governments and businesses in more than 210 countries and territories. Mastercard products and solutions make everyday commerce activities – such as shopping, travelling, running a business and managing finances – easier, more secure and more efficient for everyone. Follow us on Twitter @MastercardUKBiz, join the discussion on the Beyond the Transaction Blog and subscribe for the latest news on the Engagement Bureau.